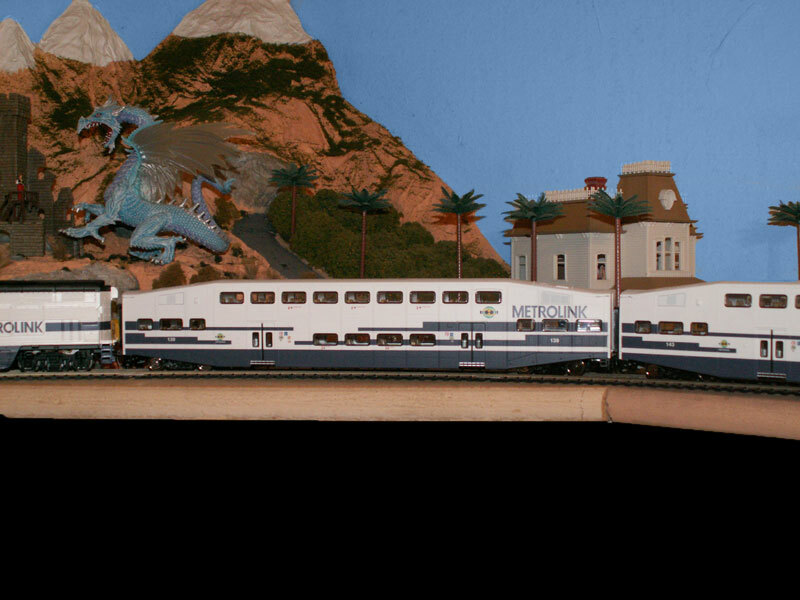 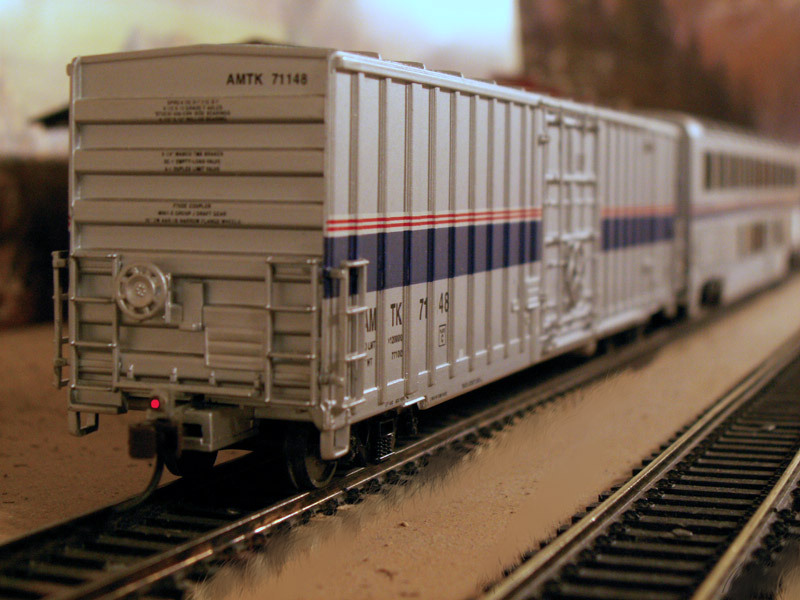 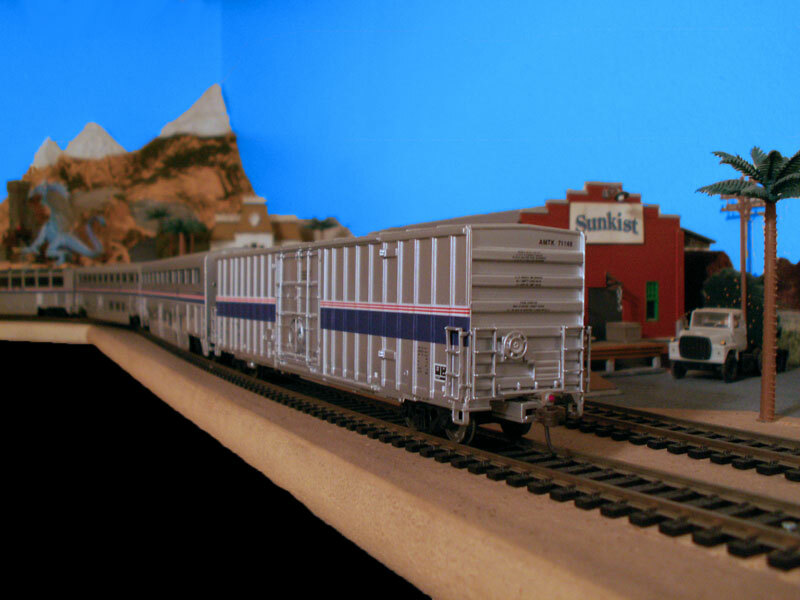 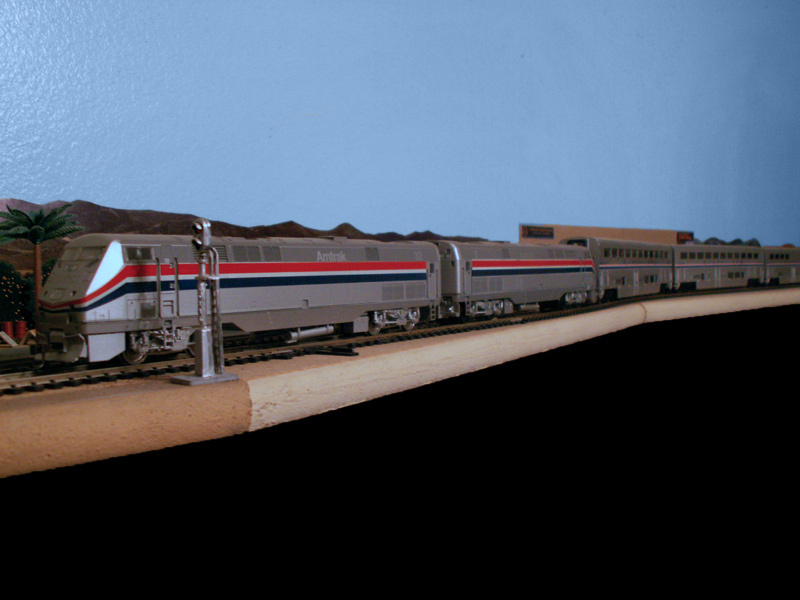 There are now seven passenger trains which run on the Lone Wolf and Santa Fe Railroad: Two long distance passenger trains, Amtrak's Southwest Chief, and Coast Starlight. 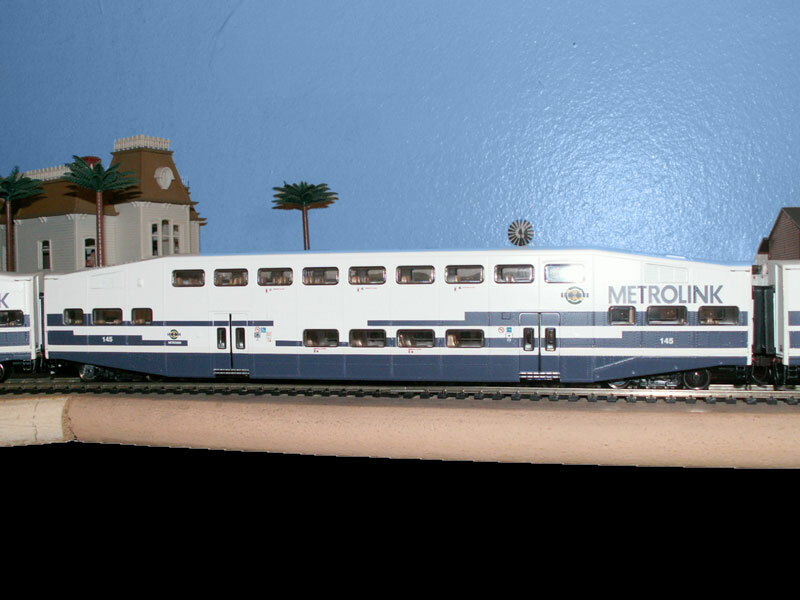 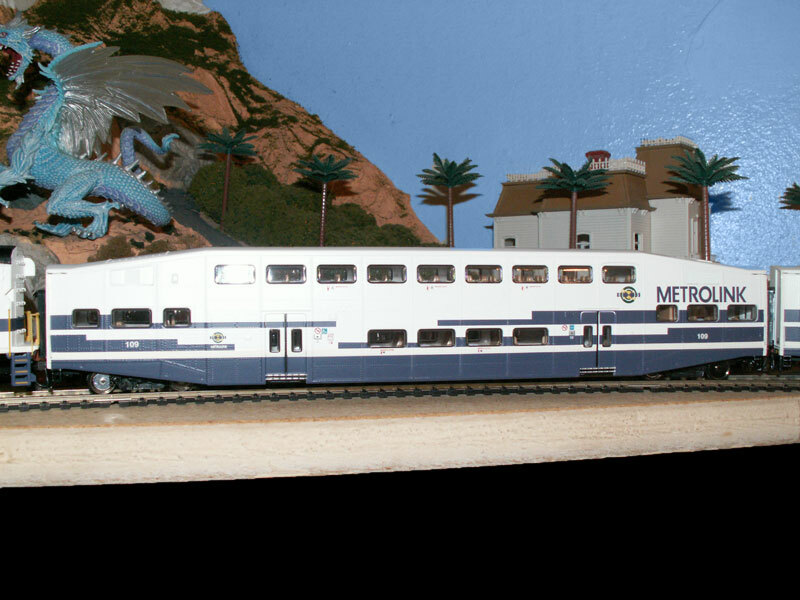 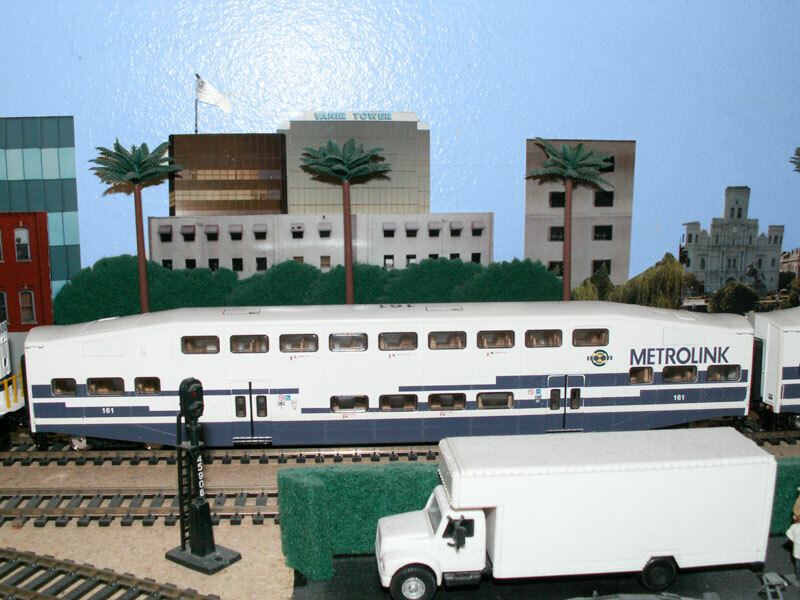 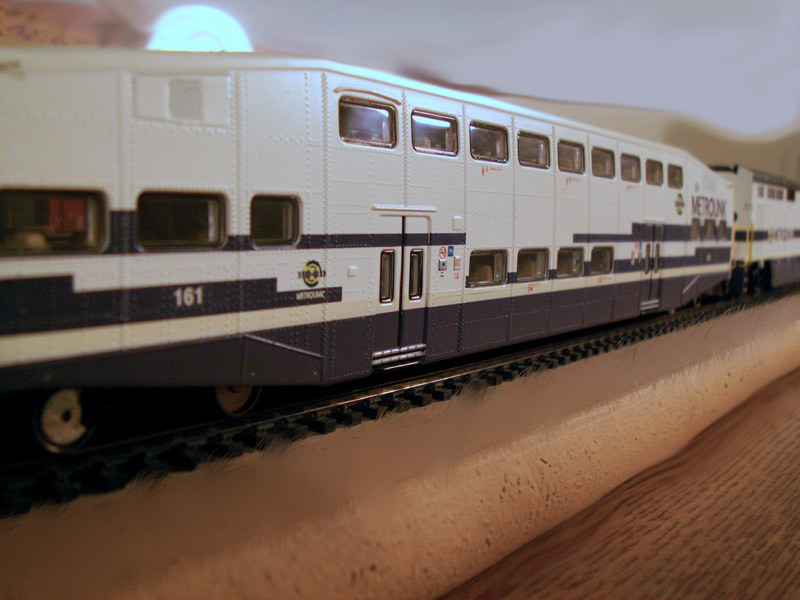 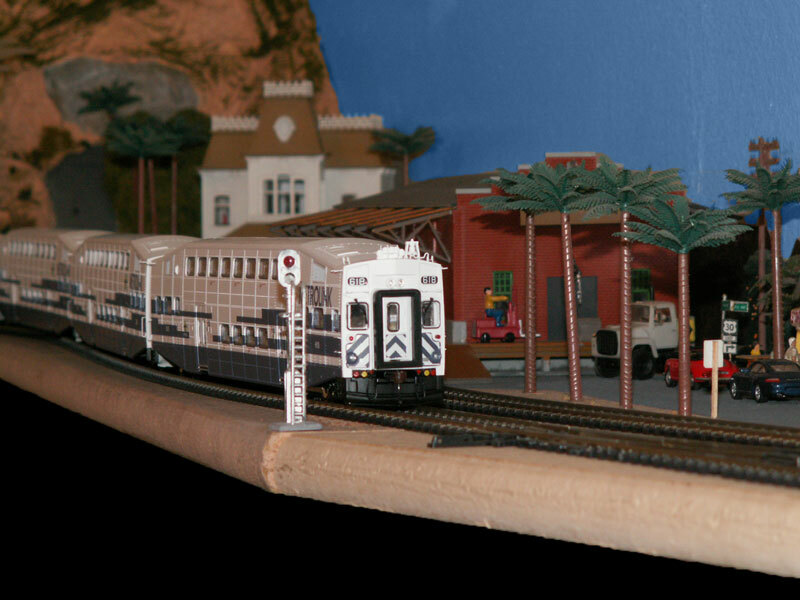 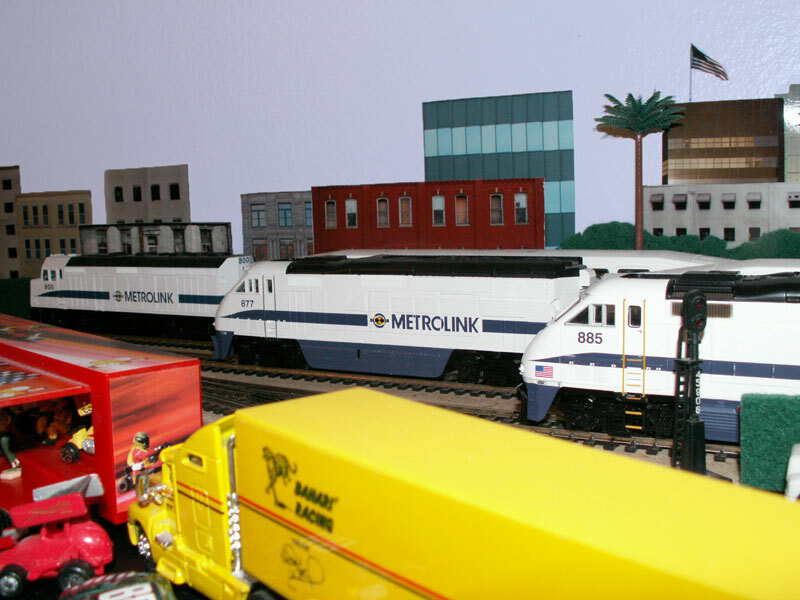 Three Southern California Regional Rail Authority's Metrolink commuter trains and two Steam Excursions. 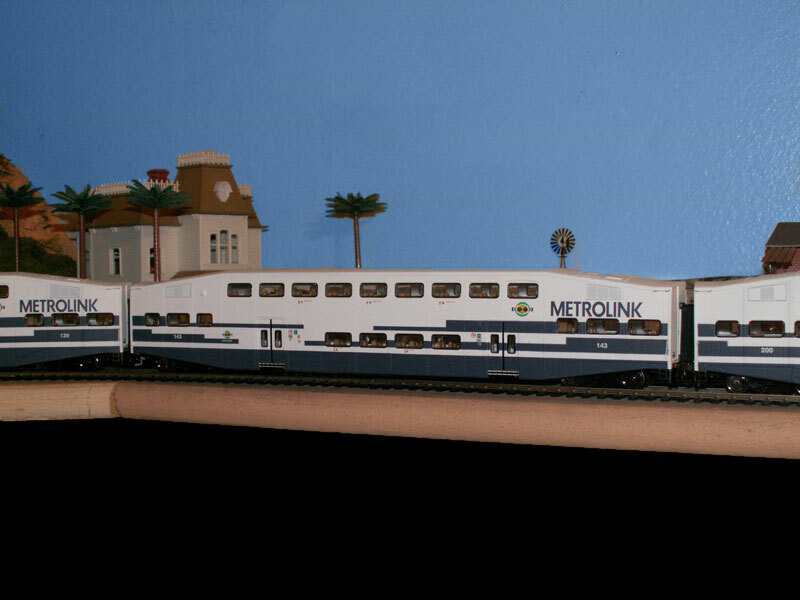 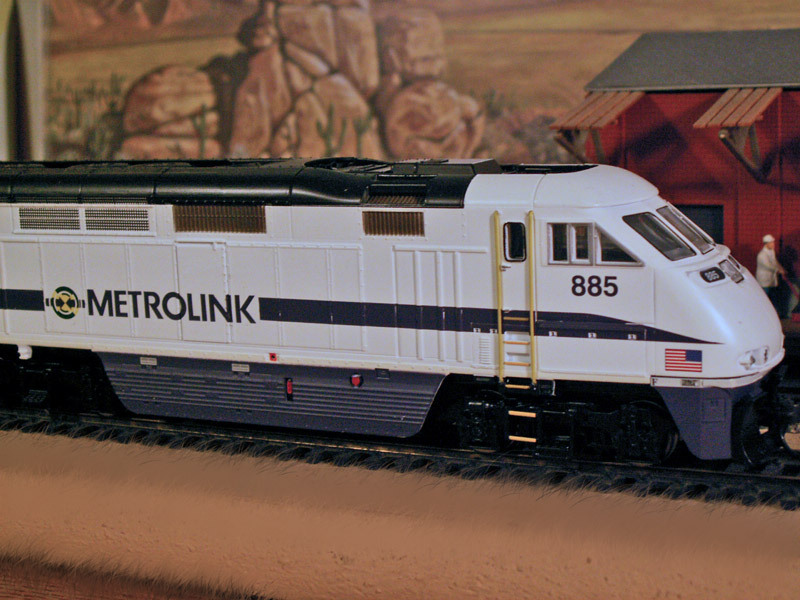 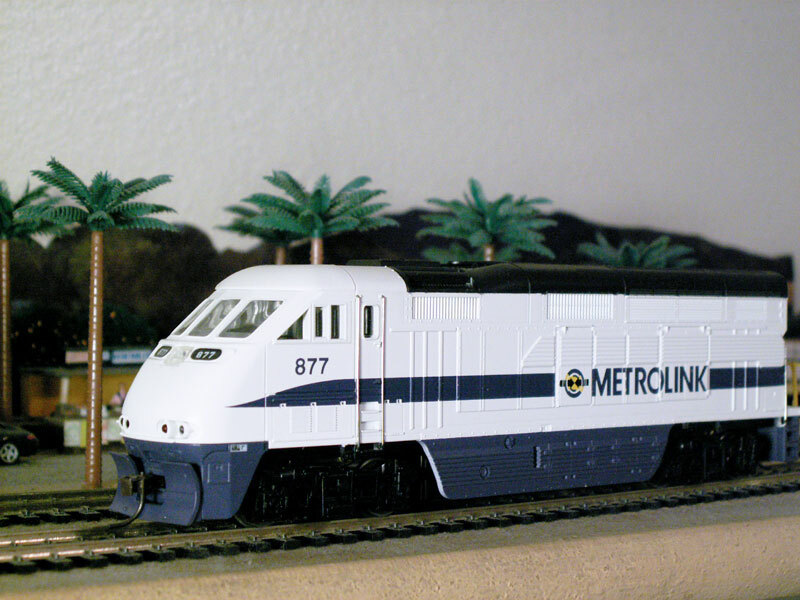 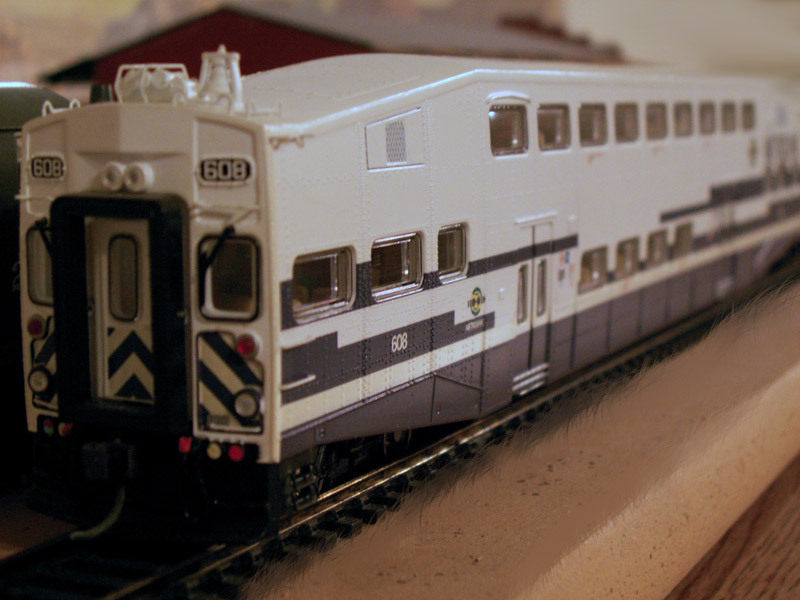 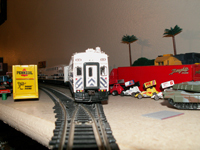 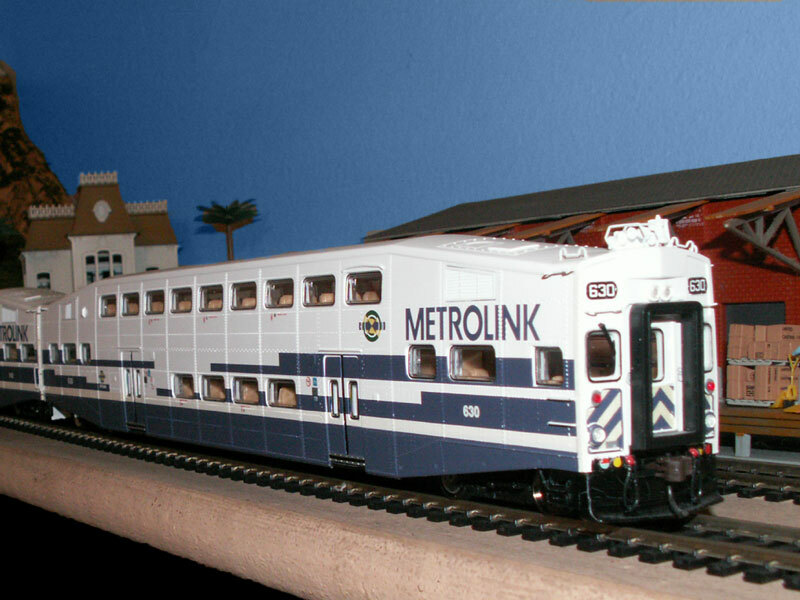 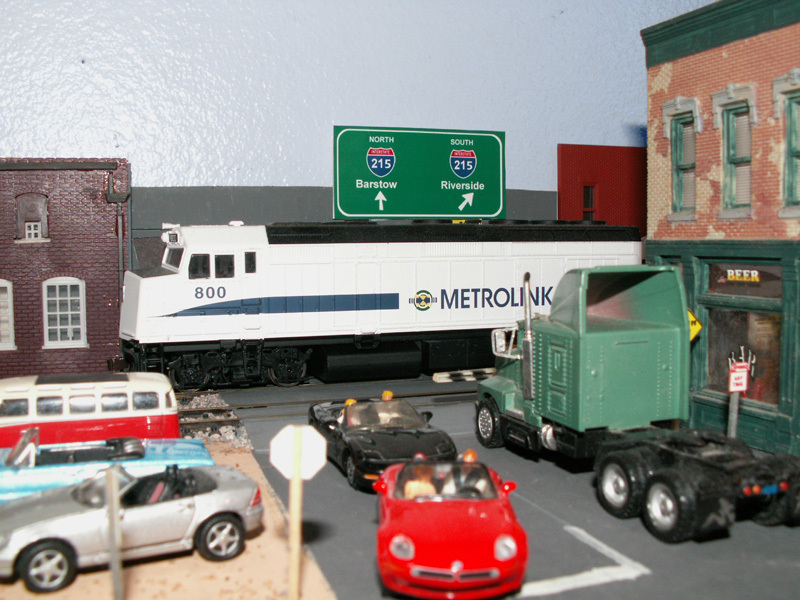 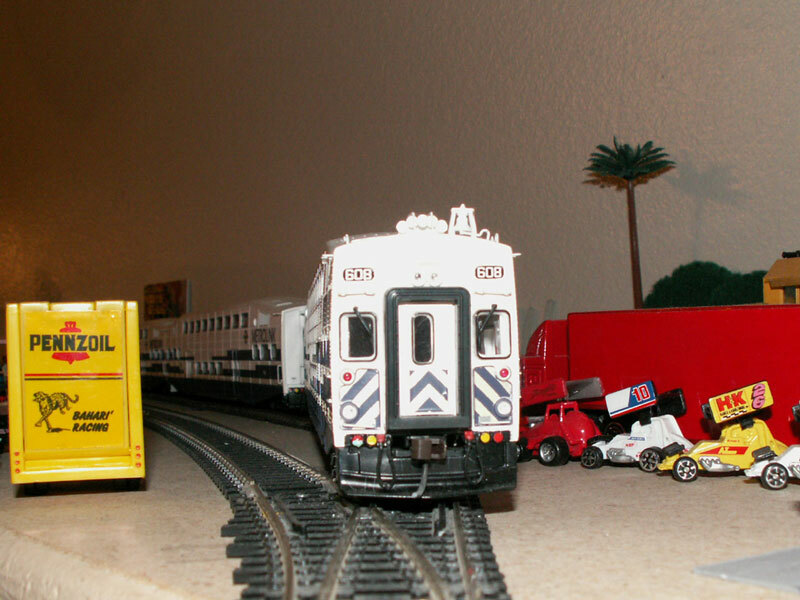 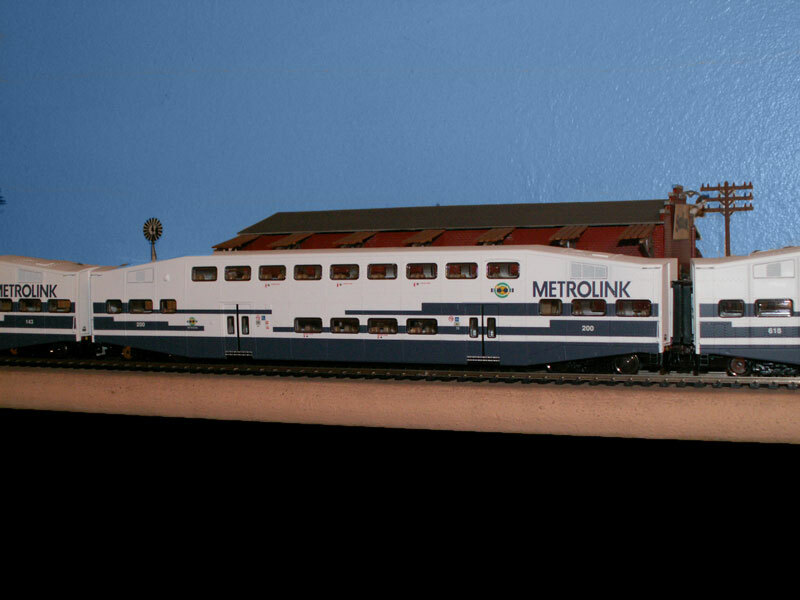 Metrolink commuter trains share the rails with freight trains from San Bernardino west to Los Angeles. 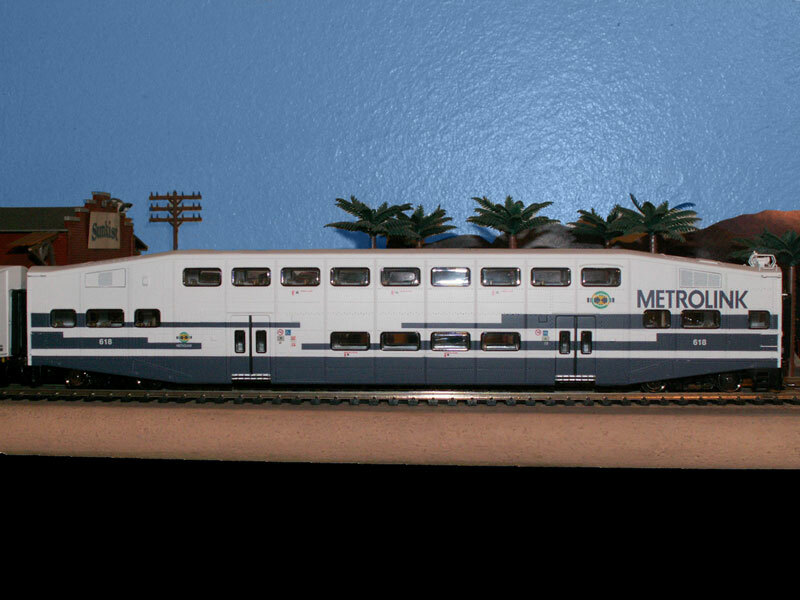 In the future they plan on expanding service one town at a time heading east from Berdoo to Redlands, up to the north end, and finally out to the foothills and also up to the high desert to serve the ever growing number of long distance commuters. And Metrolink runs the Beach Train down through Orange County to San Clemente State Beach. 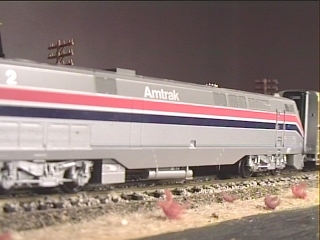 Amtrak's Southwest Chief passes through in the evening on it's two day two night journey west from Los Angeles to Chicago. 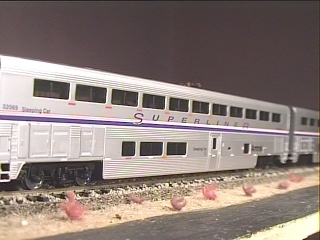 It makes two stops on the scenic route, one in San Bernardino, and one in the High Desert, before heading on east toward Chicago. 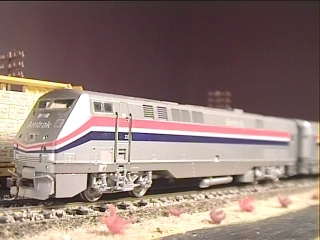 A return run passes in the other direction in the evening. 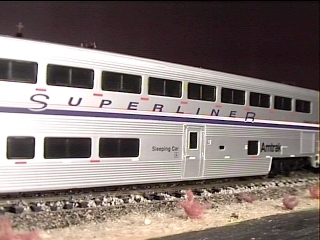 Once again it stops in San Bernardino and the High Desert, then heads west towards Los Angeles. 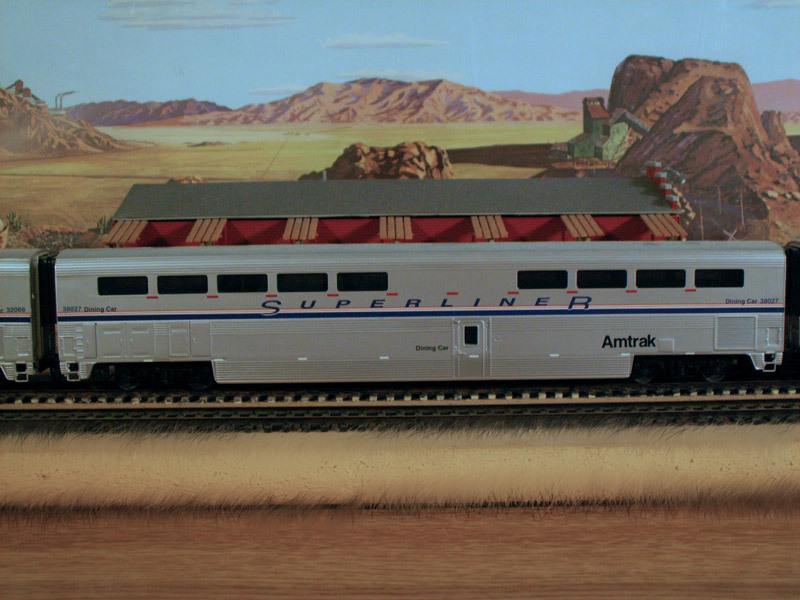 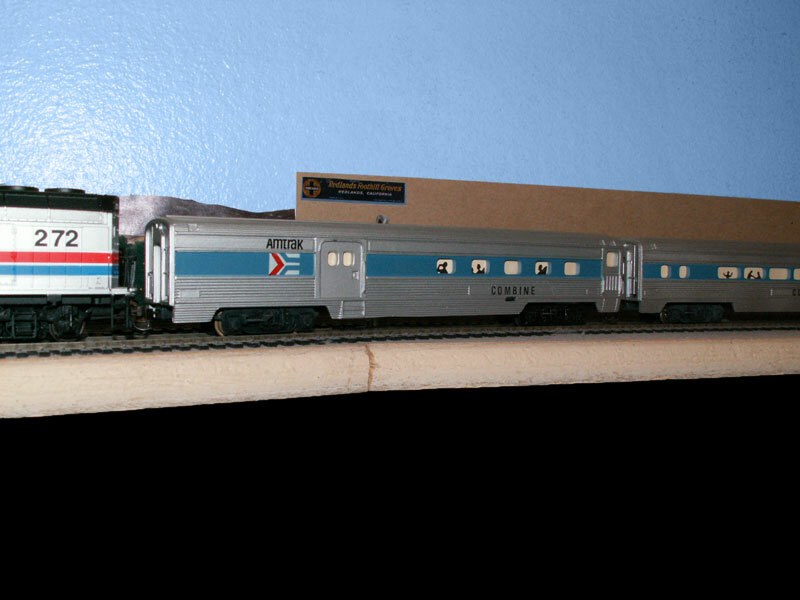 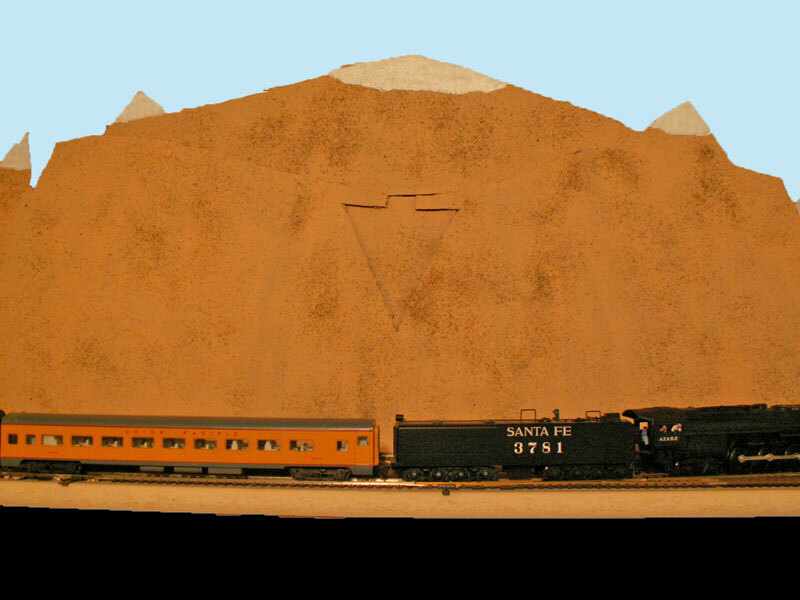 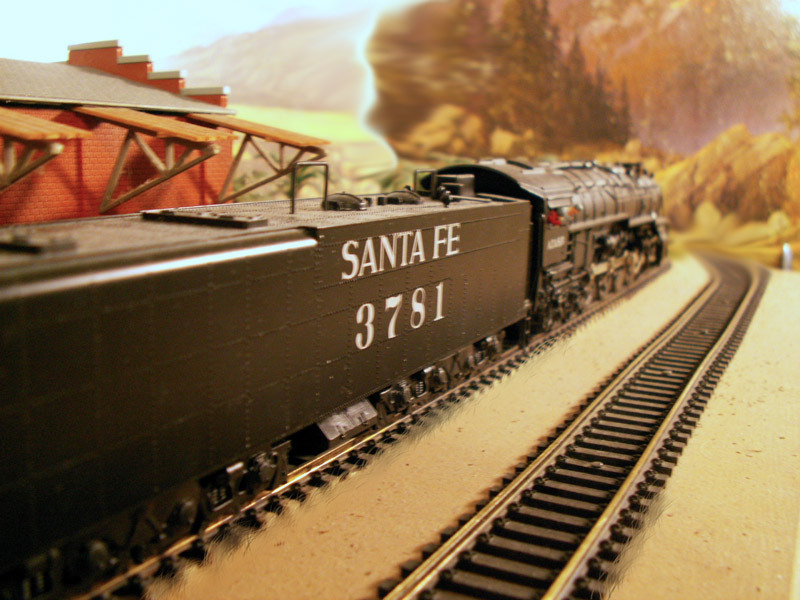 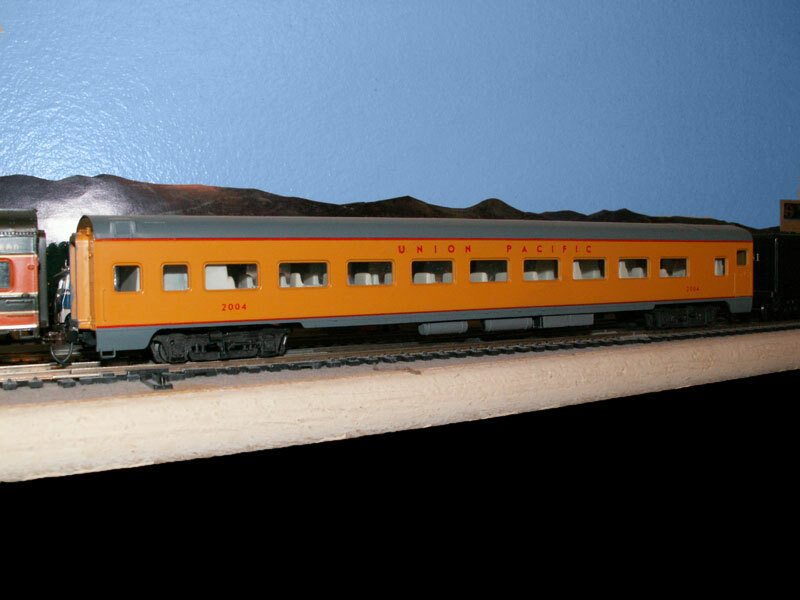 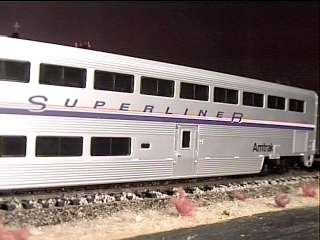 Once upon a time before Amtrak, Santa Fe ran this legendary train, known for it's double-decker Superliner cars. 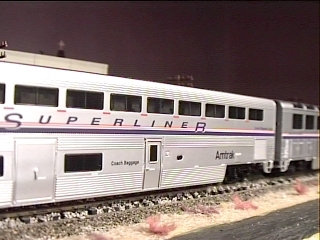 It was the way to travel between Chicago and the coast. 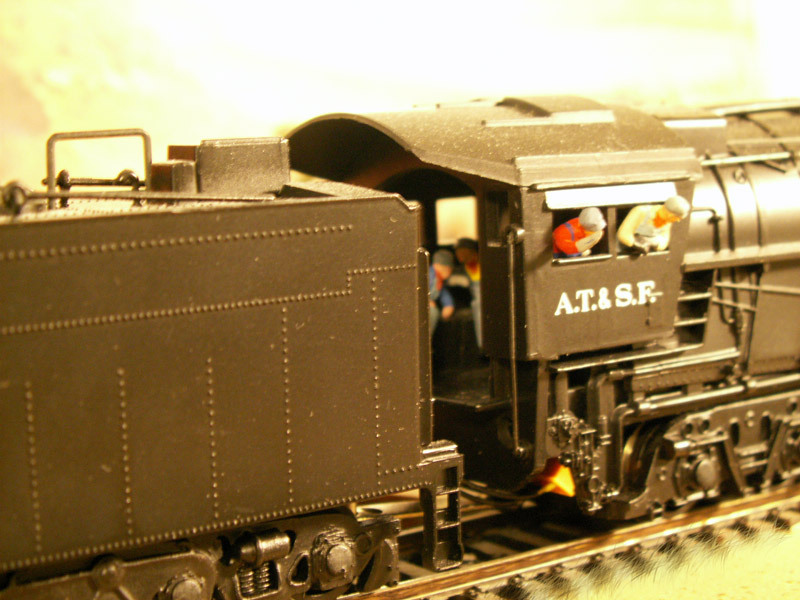 The train is pulled by two AMD-103 P-42 locomotives. 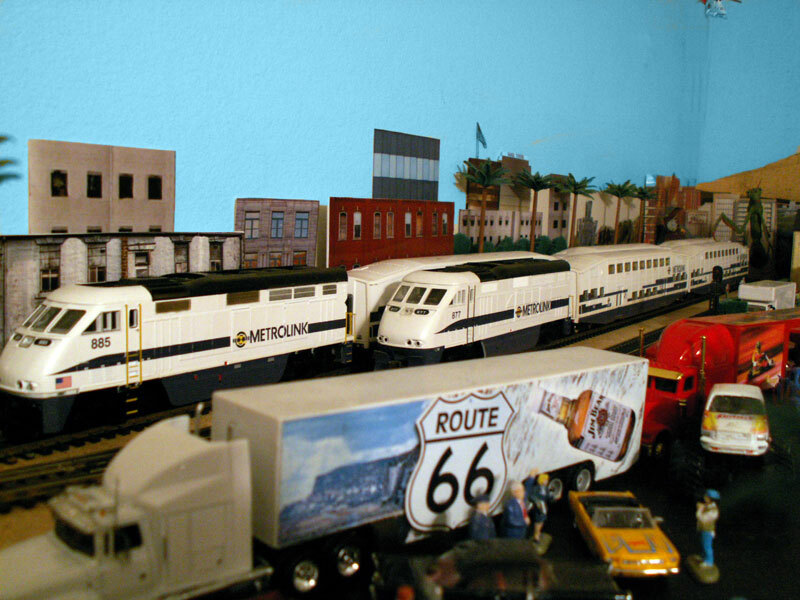 The locos are Athearn and the cars are Walthers. 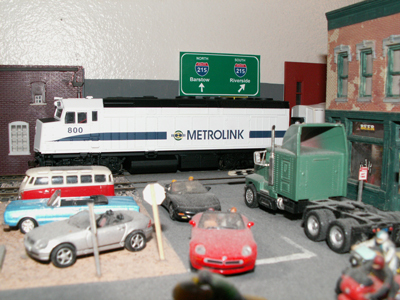 More cars will be added when the budget provides for them. 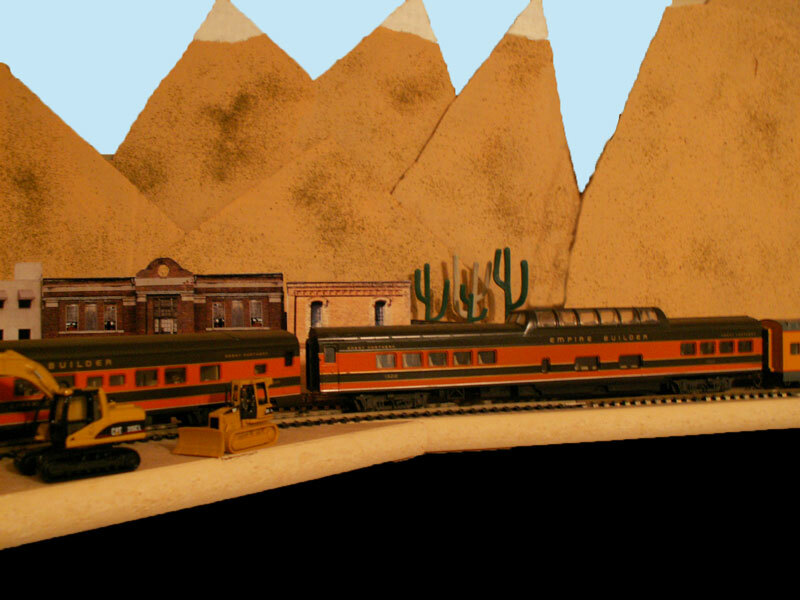 The consist is in the following order: Locomotives, sleepers, dinner, lounge, coaches, baggage coach and express box cars at the end. 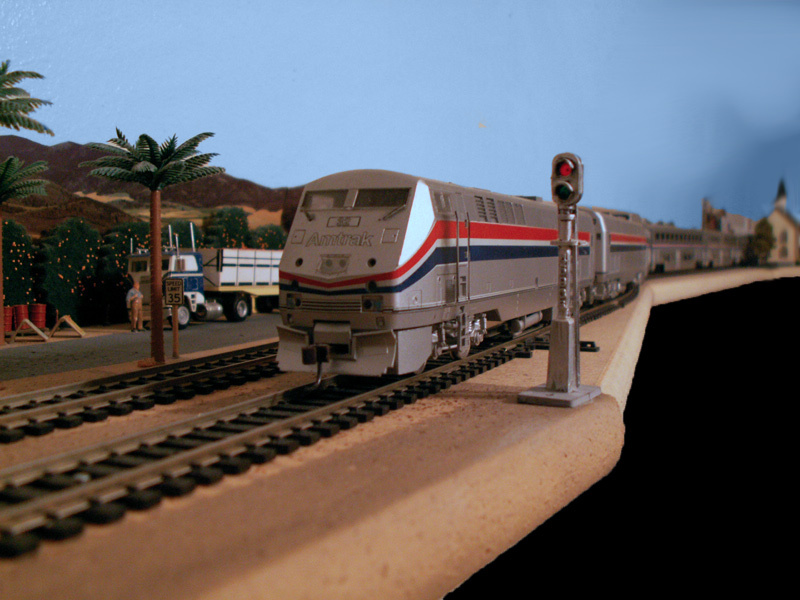 Amtrak's Coast Starlight usually runs along the coast but sometimes it has to be rerouted and when that happens it goes from LA through San Bernardino and then up the pass. 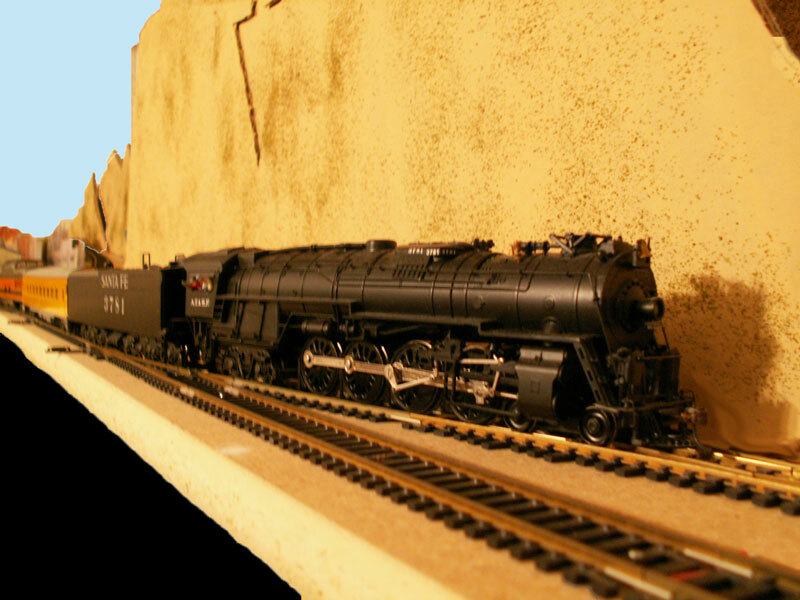 The San Bernardino Historic Society runs steam excursions several times a year. 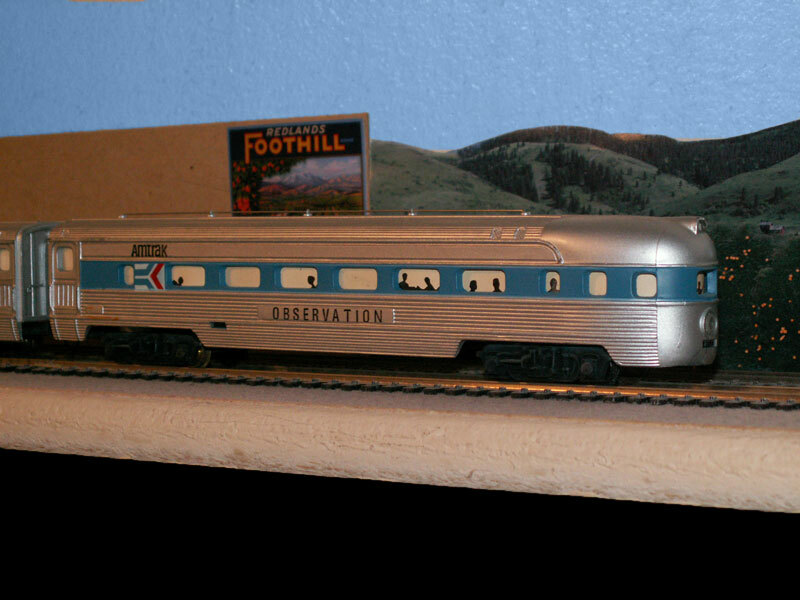 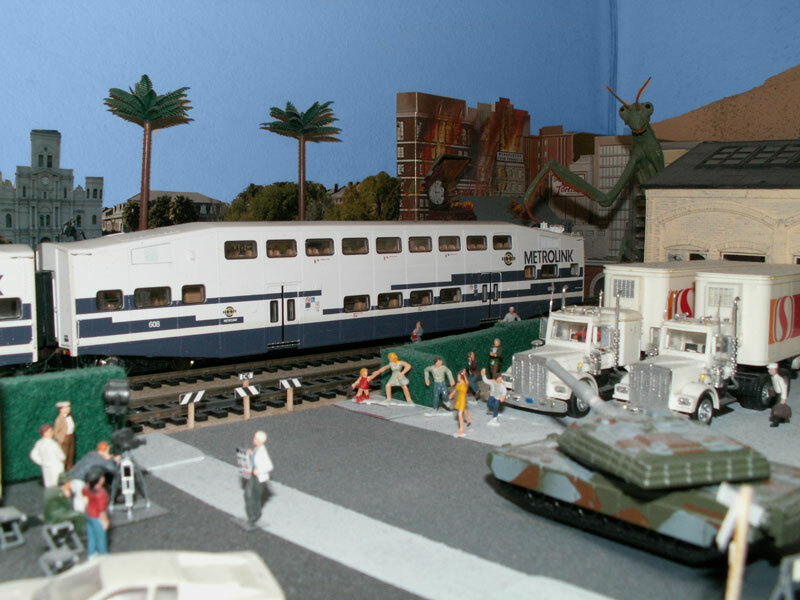 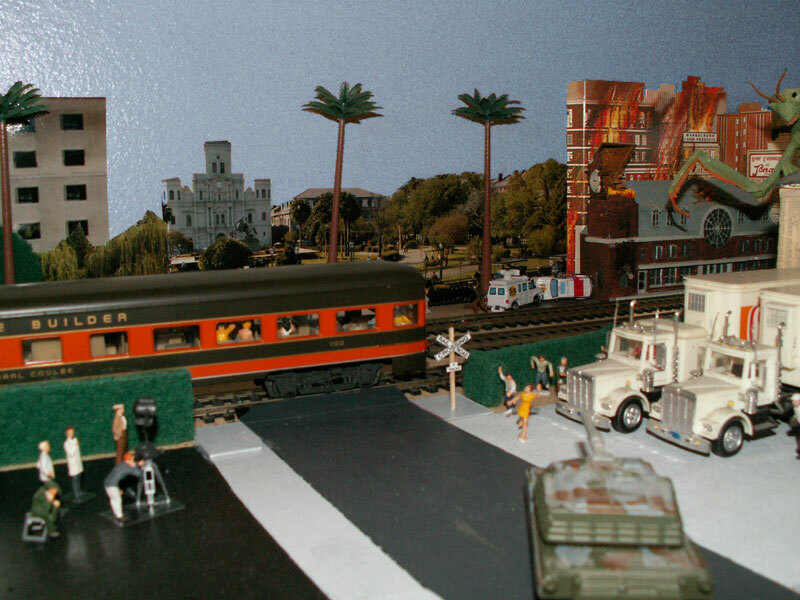 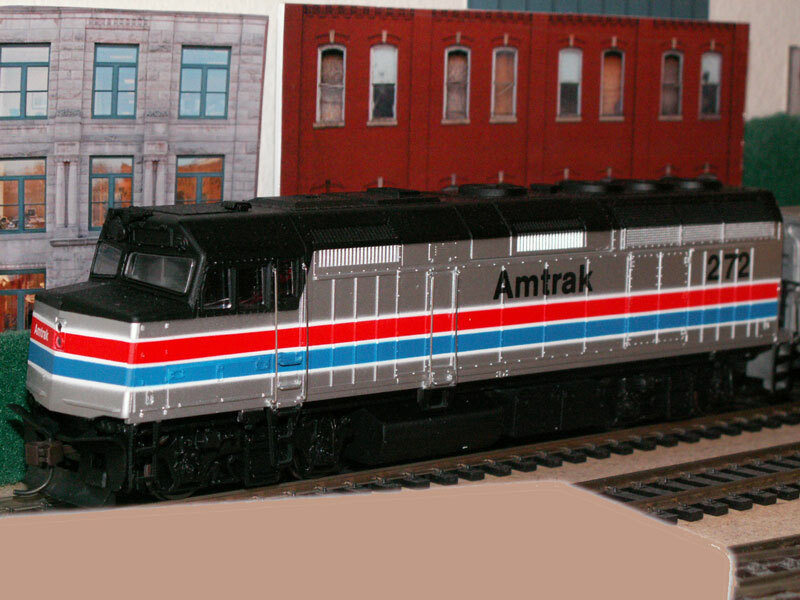 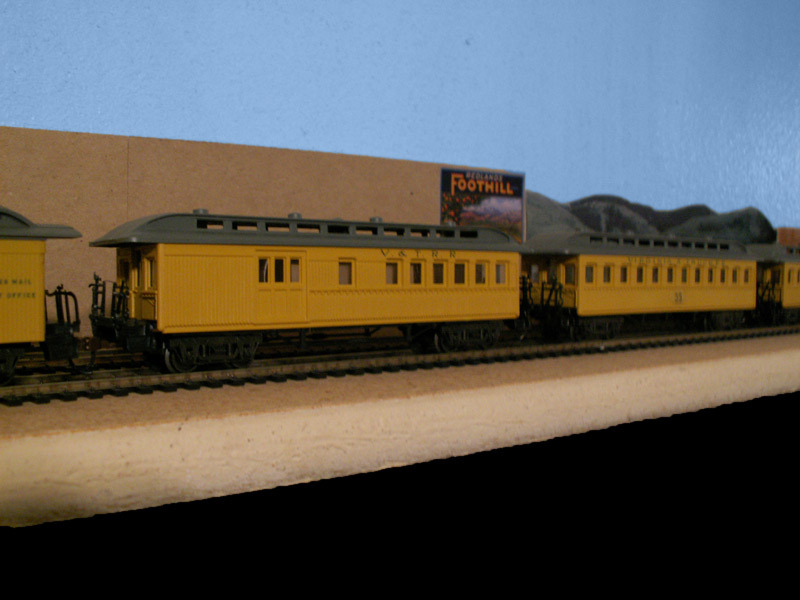 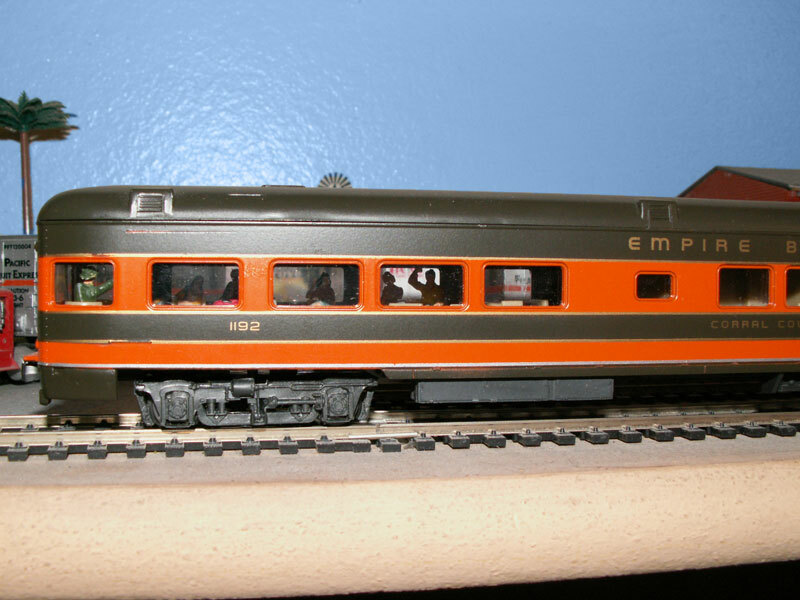 They feature the restored Santa Fe 3781 and a rainbow of streamline coaches and observation cars from several western railroads. 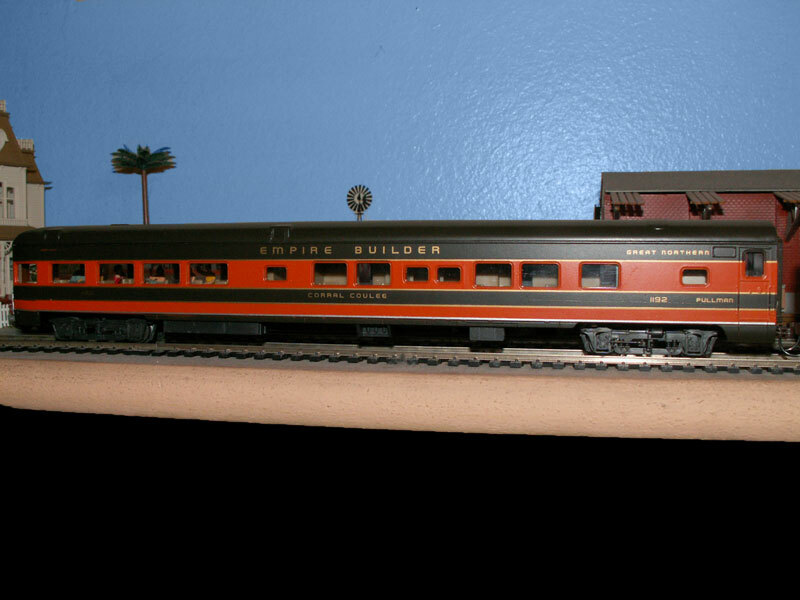 Also a steam excursion featuring The Jupiter, a Central Pacific, American 4-4-0, with old time passenger cars. 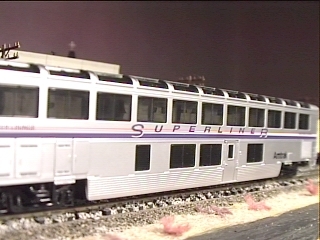 Seems passenger service is making a comeback! 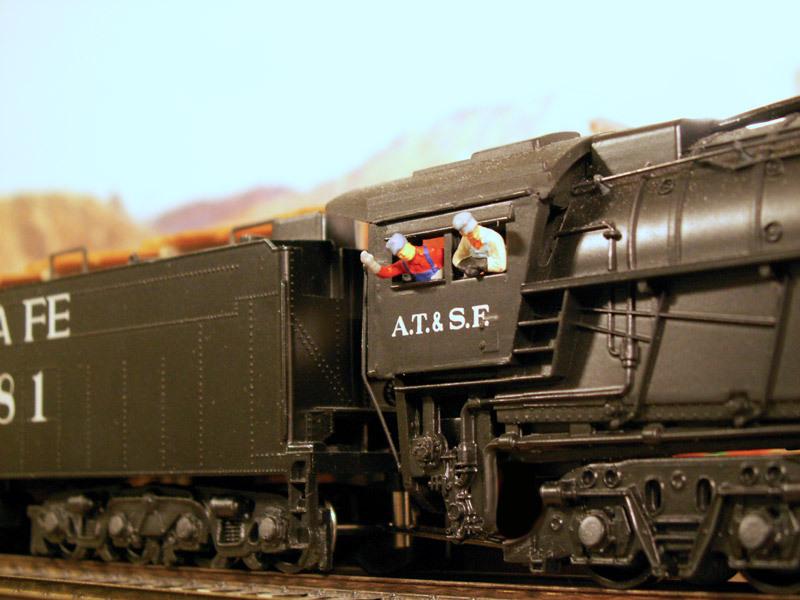 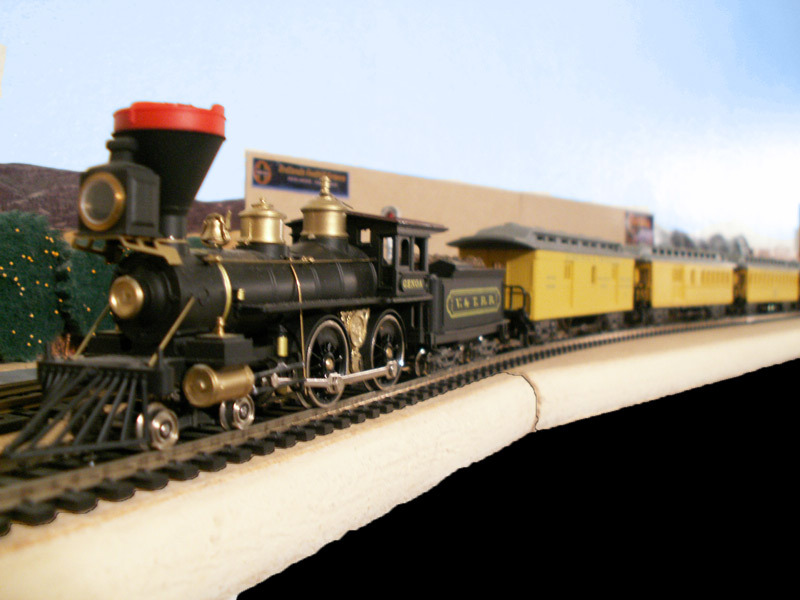 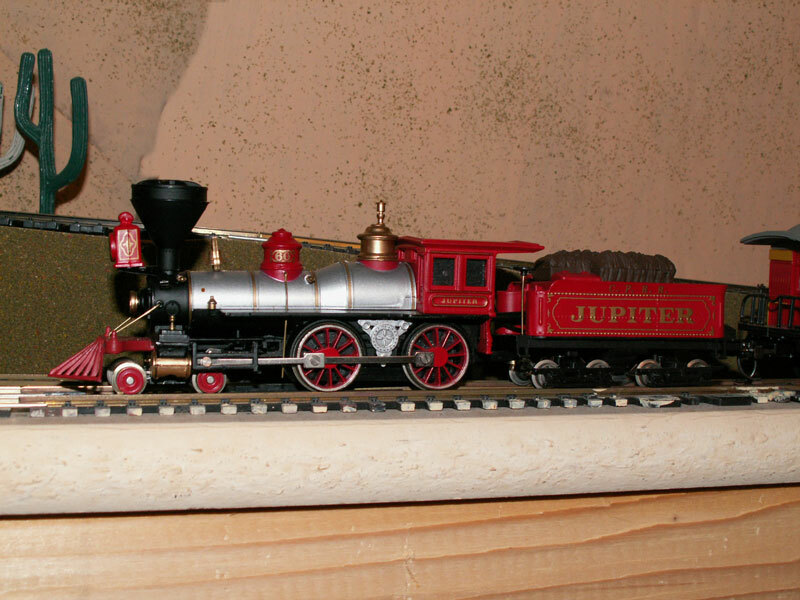 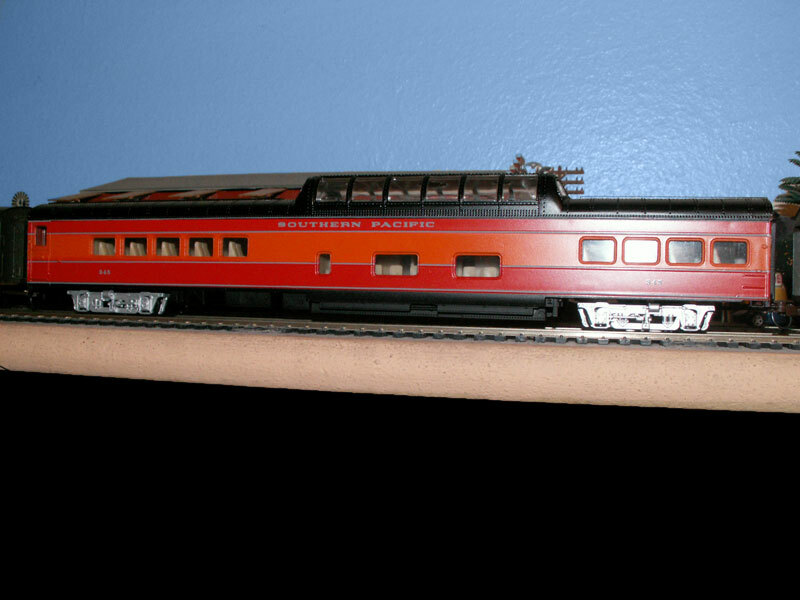 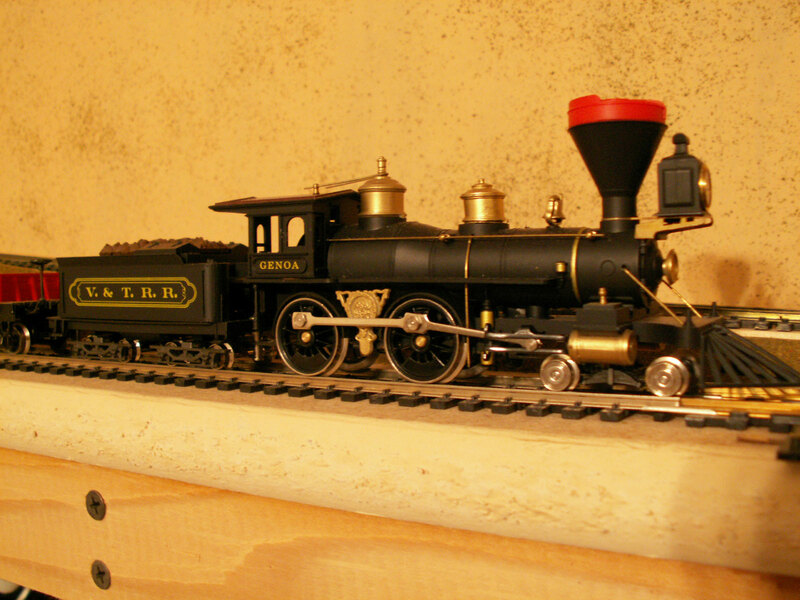 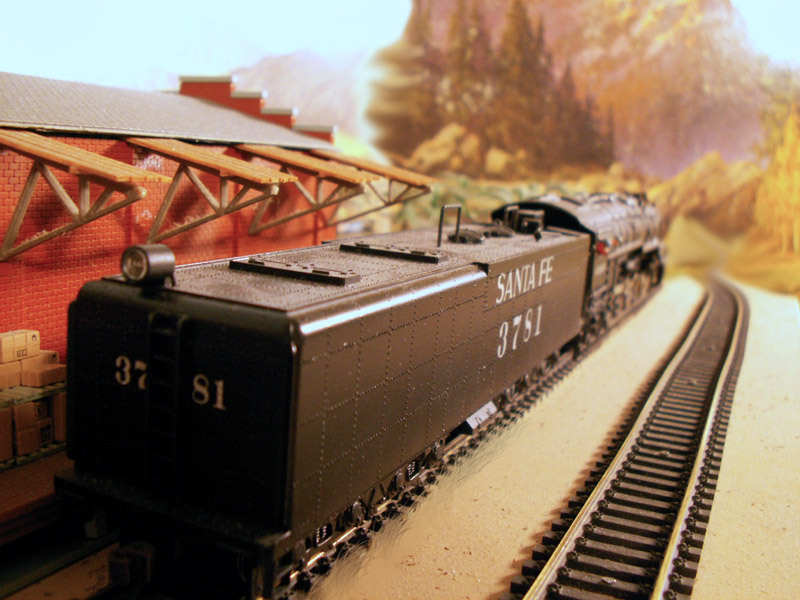 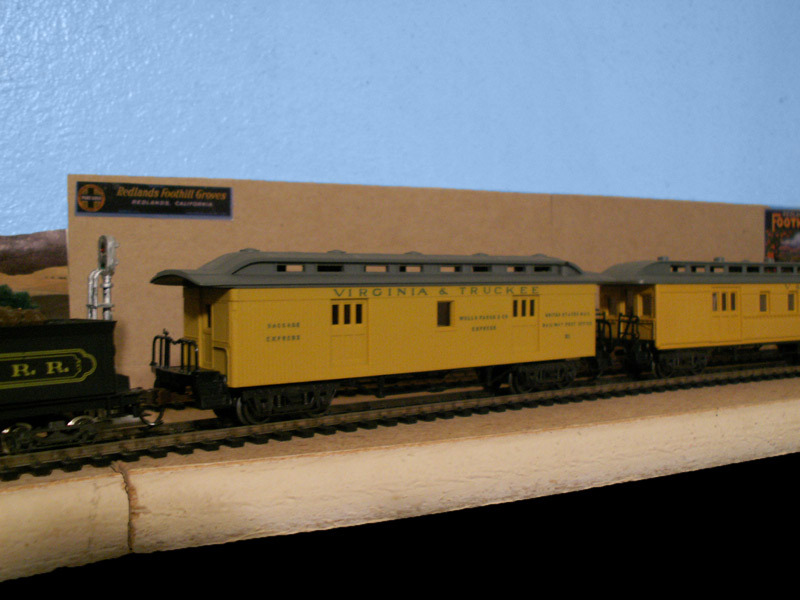 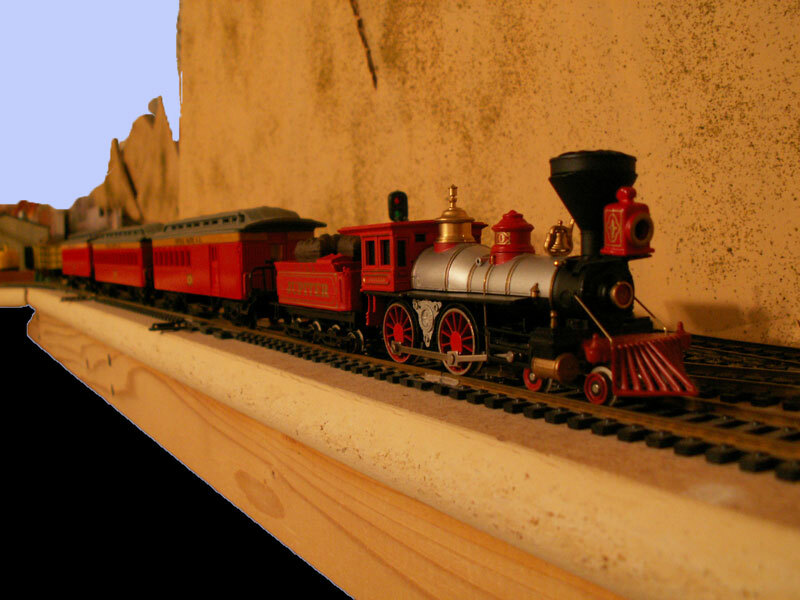 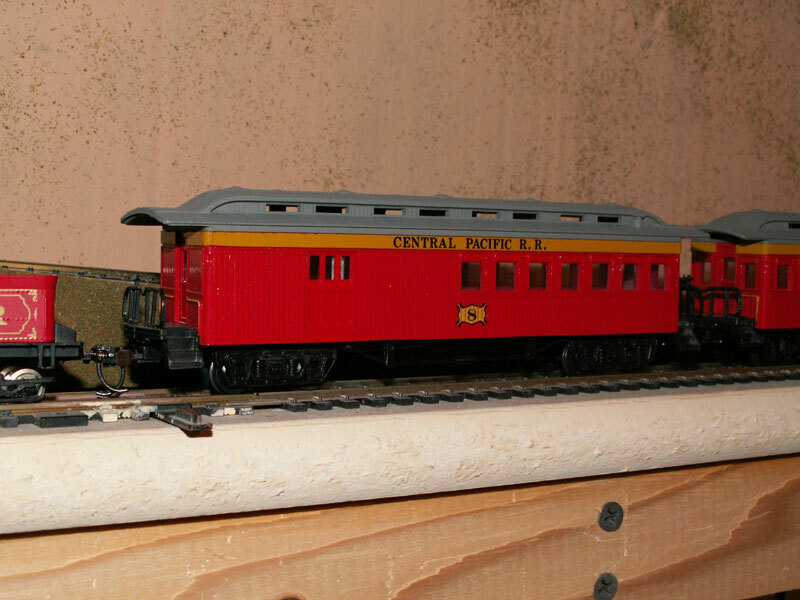 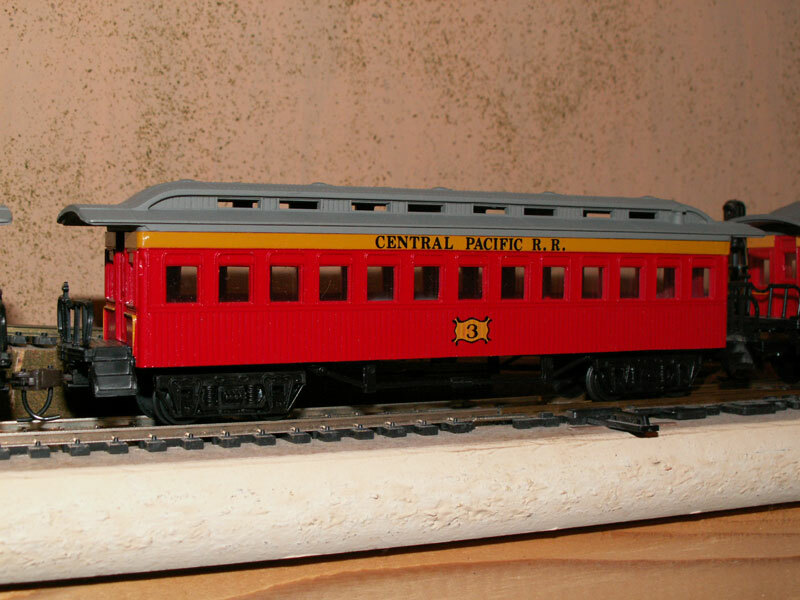 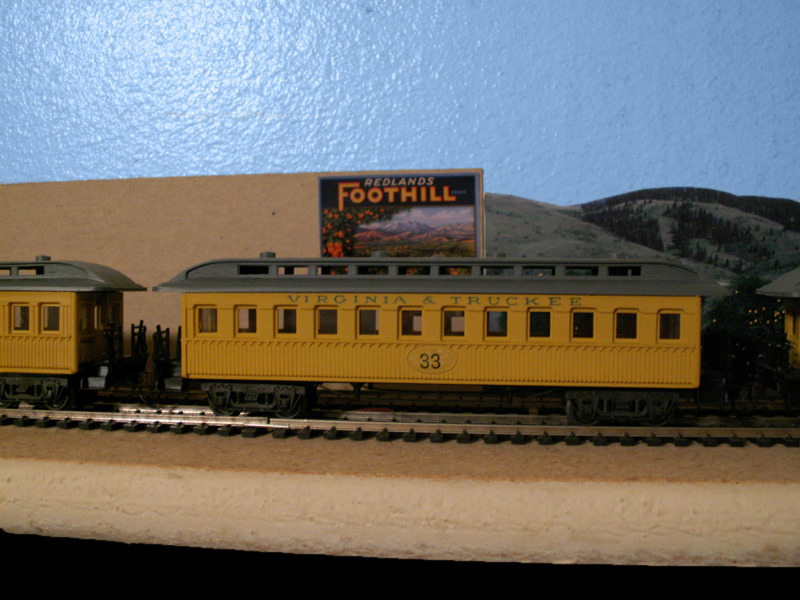 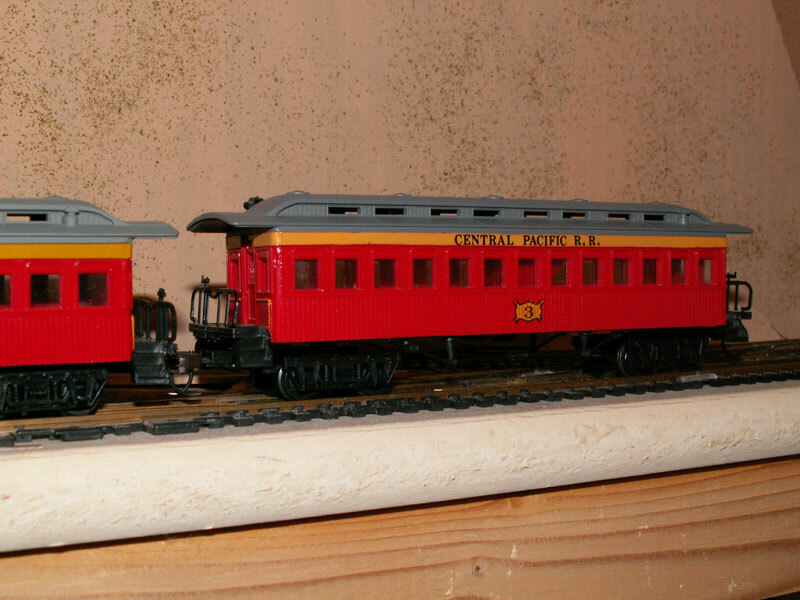 Another train in my collection is this Central Pacific passenger train featuring The Jupiter 4-4-0 steam locomotive. 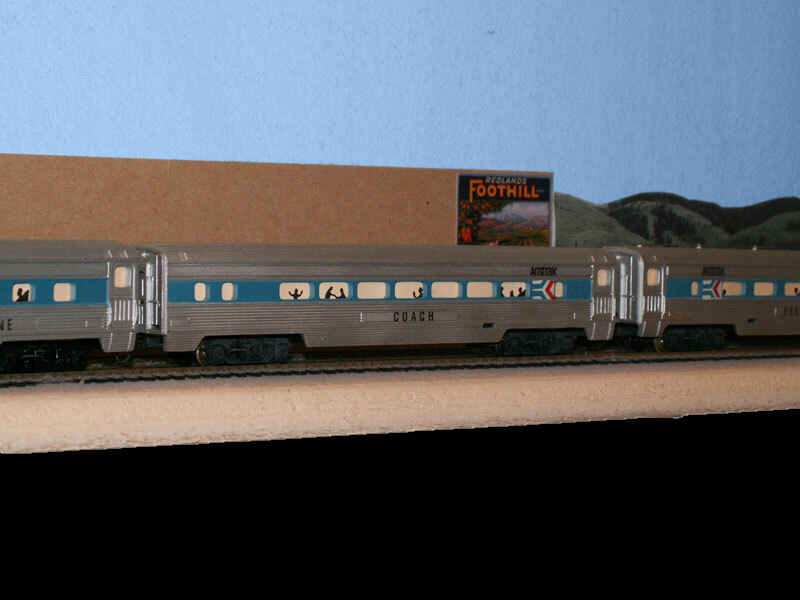 Sadly I bought this on eBay as New but it was used and missing some pieces which were broken off.